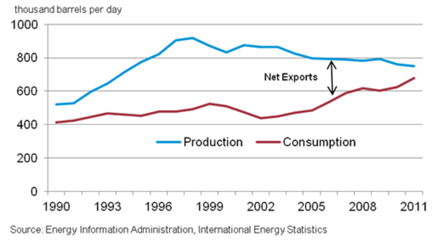 The EIA anticipated that Brazilian production would reach 2.8 mbd in 2012, and 3.0 mbd this year. However, as the latest MOMR from OPEC notes, Brazil will likely produce only 2.61 mbd this year, with the potential to rise to 2.67 mbd by the end of the year. 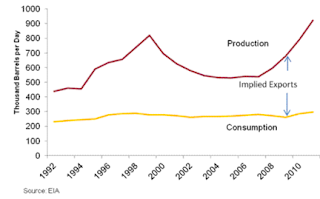 However the rise in domestic consumption, and the failure to achieve the production goals expected has had an impact on the exports to the United States. The EIA reported that Venezuela produced some 2.47 million barrels a day in 2011, of which the USA imported roughly 1 mbd. That volume has, however, been declining for some time. (Note that in the plot below the Virgin Island imports should perhaps be included, because the crude that runs through the refineries on the islands originates in Venezuela, but they are not in this plot). At the same time a significant proportion (250 kbd in 2010) is now being shipped from Venezuela to China. 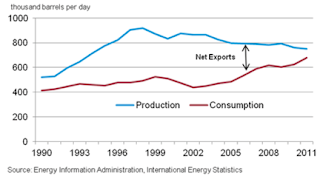 The situation in Argentina similarly shows that as with the other countries internal consumption is rising, while in this case overall production is falling and there is a consequent impact on exports. China has been getting around 20% of Argentinian exports, while, in 2011, the USA got 40%, but the volumes of US imports have now turned negative. Of the five countries that were tabulated at the top of the post, Colombia is the exception. Production is still rising significantly, however it should be noted that, back in 2010 when the USA received some 422 kbd of crude and refined products from the country, China was financing a pipeline to carry 600 kbd to the Colombian Pacific Coast. The oil for the pipeline is anticipated to come from both Venezuela and Colombia, and the preliminary agreement for its construction was signed in May, 2012. Venezuelan agreement is still lacking to the deal and Venezuela, which was supposed by now to be sending natural gas to Colombia (after having received supplies for years) has still not made the switch. Volumes of exports to the USA from Colombia have fluctuated recently, while India and China have been acquiring oil wells and their production, which then ships to Asia. Figure 7. 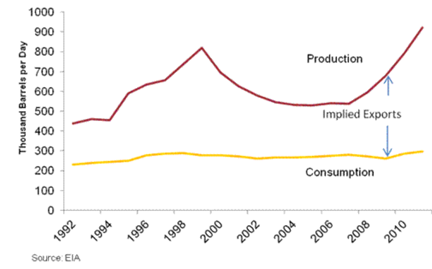 The changing picture of oil exports to the USA from Colombia (EIA). And that leaves Ecuador., which for those who might have forgotten, is also a member of OPEC. (It rejoined in 2007 ) It produces around 500 kbd, and with internal consumption running at around 200 kbd, exports the rest. The recent news that the President of Ecuador is opening the rain forest to oil development, after trying to find funds for preservation of the forest without it and failing. Ecuador has an increasing debt with China (about $20 billion) and this is forcing it to use oil exports as a way of servicing that debt. One $2 billion loan, for example, carries a return agreement for some 130 million barrels of oil over six-years (60 kbd). Part of the loan from China will be spent on refineries in country. The point to note in all five cases is that the imports to the United States have been declining. Given the increase in US domestic production that is not wholly surprising, nor is there yet any immediate cause for concern. But it is what is happening to whatever excess that these countries produce, over that consumed domestically and in the US that is significant. Because, increasingly it is going to China, and to Asia in general. The concern that this raises is that, should US production not continue to rise at the rates that the more cornucopian of the main stream commentators suggest, then there will come a time when the US will have to go back to its suppliers from the last decade to ask for more. And at that time the odds are going to be high that either the countries won’t be able to meet the demand because their own domestic consumption has consumed the surplus, or that the surplus has been sold to China. 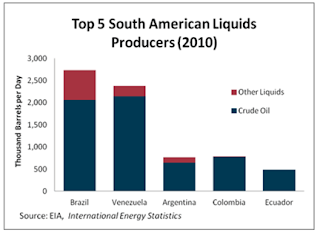 Given that China is making investments at the moment in the South American oil infrastructure, from wells to pipelines, means that it will control this production, and that removes a significant source of supply, at a time when it will be needed.